LTJG Jason Pawlak is an Information Warfare Officer originally from Mason, Ohio. After graduating from the University of Cincinnati with a degree in Computer Science, he commissioned through Officer Candidate School in October of 2010. Jason took orders to NIOC Texas where he works in Computer Network Operations. Outside of work, Jason loves spending with with his wife, daughter and two dogs. He is also a self-diagnosed geek and enjoys developing iPhone apps and writing on his own blog. Admiral Greenert’s first official inject into the blogosphere as our Chief of Naval Operation’s back in October of 2011 introduced three priorities and three tenets that we have now heard many times and are the focus of his tenure. Right then, right there, with keystrokes and mouse clicks, our CNO exercised the second of his three tenets, Operate Forward. How wonderful of an opportunity to reach people! Through an increase in a Navy digital footprint, we can, today, work towards meeting a challenge that plagues not just our Navy but all organizations larger than a workforce of one, communication. To meet this challenge, some commands have started Facebook groups to provide outlets for Sailors to gather as well as broadcast the word out for command events or community volunteer opportunities. 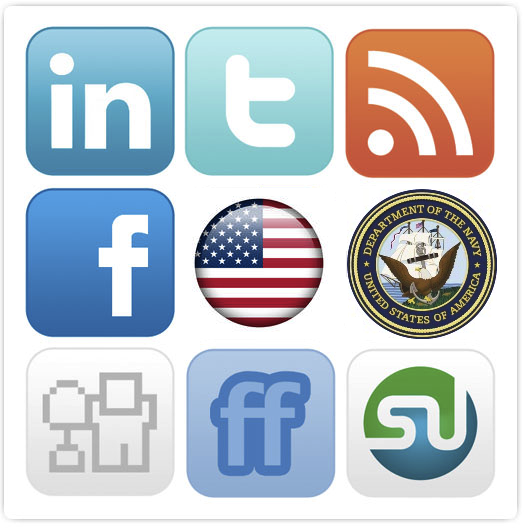 Through communications on social networks, we push important bytes of information or news to our Sailors at home. Collaborative efforts like IDCsync are trying to “enhance our collective situational awareness” by making it easy to find relevant news and information for its niche/fleet. Forums like AirWarriors and USNavyOCS provide gouge, pass down, and commentary for their niches as well. And these online ‘hangouts’ are alive. Spend just a few minutes in any one of them and you will see a thirst for knowledge and camaraderie that grows communities. Our families are also online, seeking that same type of community as their Sailor. Is online the only place that offers the benefits mentioned above? Thank goodness no. It is just one of many options. But it is an option that many people are afraid of. While I could never over-emphasize the importance of maintaining careful oversight of your own digital slice of the Internet, I encourage you to go beyond your personal firewall and experiment with new ways to communicate. You might be amazed at who is Googleing/Binging/Yahooing for your insight. I’ll leave you with one small success story. A Dad who also happens to be a US Navy Lieutenant, has a passion for writing. He describes himself as an “LT in the Navy trying not to mess my kids up too much.” Great tagline for his well written and often comical take on the challenges (and rewards) of being a family man as well as a Surface Warfare Officer. In less than 400 words per post, he captivates an audience of friends, family and Shipmates alike, along with their support, which in fact lead to his nomination for a Milbloggie. Parsing comments left on his posts, it is clear that MilitaryDad is making a positive impact on behalf of our Navy (unofficially). For his target audience (aka readers) that have limited military exposure, his posts humanize our world. And for his target audience of military members and their families, his posts are honest and relatable, which undoubtedly helps spread some of the burden service member’s families deal with day to day. That said MilitaryDad is (and very successfully I might add) Operating Forward. I’ll be seeing your around the Interwebs! Good for you Jason! Thanks to the good CDR for giving Jason a chance to get his views to a wide audience. Matt – I thoroughly enjoy sharing this platform with the talent that I am fortunate enough to have in my life. I appreciate Jason’s thoughts and am pleased that he chooses to share them. I also appreciate the fact that you joined the conversation. Thanks!